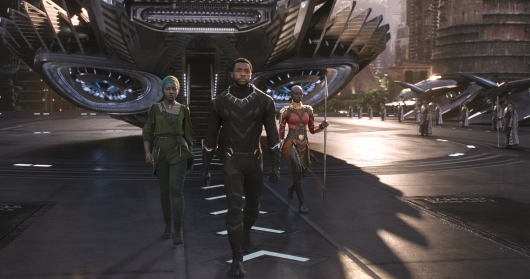 Just weeks after the events of Captain America: Civil War, T’Challa (Chadwick Boseman) returns to his home of Wakanda, a nation that has been hidden away from other nations who would exploit the nation’s most valuable resource, vibranium. The exposition is told beautifully via living sand, which forms the people and its setting. But as he ascends to the throne to become king, T’Challa will learn that it’s not easy to progress to an unforeseen future because the fear of change could have an adverse affect on the country. Things only get more difficult when Erik Killmonger (Michael B. Jordan), a formidable opponent and outsider who proves to be more than a match for the young king, seeks to change Wakanda’s old ways. While films like Captain America: The Winter Soldier and Captain America: Civil War explored the dangers of protective overreach and superhero oversight, Black Panther gets grounded with its politics. Here we see T’Challa trying to progress his native Wakanda forward but also being held back by the old ways. In the film, vibranium is the nation’s most valuable and most powerful resource. If weaponized, it could tip the balance to any warring conflict, so it is easy to see why they are hiding from outsiders who may exploit their valuable resource for nefarious purposes. But we also get to see how Black Panther uses some of those comic book themes as a reflection of today. There are children forced to become soldiers. Barriers created for protection and safety. Most importantly, we get to see a film that speaks to representation. People of color can see that there are heroes who look like them. Not only that, but the characters’ struggles are also their struggles. Providing more details to that would be delving into spoiler territory, but it is important to have a film like this, especially in times like these. There is even a cultural divide that speaks to what is going on today. But the characters never lose sight of who they are and where they are from. They carry their nationality on their shoulders with pride. While MCU deserves villains like Loki and Ultron, Erik Killmonger is the kind of villain the MCU needs. Jordan absolutely hits it out of the park as Killmonger, bringing a real-world sensibility and honesty so rarely seen in Marvel films. Rather than go about bringing a one-dimensional villain with a generic motivation, writers Coogler and Joe Robert Cole gave Killmonger a Shakespearian tragedy backstory, one that would fuel his goals. Everything Killmonger does almost make you want to sympathize with that he is trying to achieve. He isn’t looking to bring an end to the world, but rather come out of the shadows after being exiled for a crime he did not commit and move a country towards a new direction. These are the kind of bold changes in the MCU narrative that we need now. One that dares to do something different and something more meaningful. And for Black Panther, we see that women are no longer sexualized or judged by their beauty. There is a different kind of beauty that resonates in this film. In the film, beauty is not only celebrated through looks but through strength, skill, intelligence. Lupita Nyong’o‘s Nakia, Letitia Wright‘s Shuri, and Danai Gurira‘s Okoye support the film in their own ways. And each brings a definitive personality that is strengthened by a strong character arc. These are well-developed characters and that carries throughout the entire film. But there is no comic book film without some very cool action sequences, and in Black Panther, almost every action sequence dazzles on screen. There is a tracking shot that follows T’Challa, Nakia, and Okoye through the course of a battle that takes place inside an underground casino. A car chase. But the ones that stand out above the rest are the fights that take place on Warrior Falls, where anyone from any tribe can fight with the current Black Panther to claim the rights to that title and rule over Wakanda. It’s at this location where fights could change Wakanda forever. It’s certainly better than the generic climatic battles that we all know are coming. After 18 films, Marvel Studios continues to evolve and adapt to the ever-changing times. They are no longer bound to the generic and tired old tropes of saving the world from an apocalyptic threat. Instead, we get a film that allows its title character to develop into the hero he was destined to be. Black Panther is that film. It holds great meaning for culture, representation, and identity. And Coogler is able to execute and tell a story with all those themes while still maintaining a superhero feel, flawlessly.